This concrete block is a particular type called an arched, scalloped, concrete edge (or edger or edging), for walkways or garden edges. Mine is a broken part of a larger unit. You could call gardening centers in your area and ask them if they carry this type. Many gardening centers have broken bits of concrete in a pile, which are super-cheap or even free. 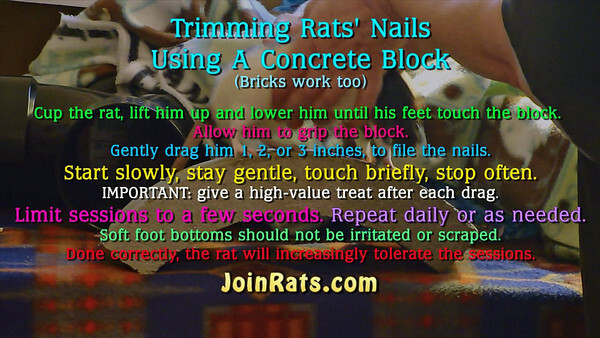 Even though I like my concrete block, I find that eventually I need my rats to get a more formal trim, and for that I take them to the vet, where one vet tech holds the rat, and the other clips the nails. I personally can't see that close up to do the clipping myself. 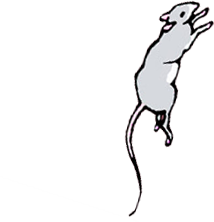 Do you have trouble seeing your rats nails up close, to see where to trim with clippers? Do you worry about clipping into the quick, causing bleeding that is difficult to stop? Do you have squirmy rats who think the idea of a dremel tool equates to a nuclear explosion? Maybe using a concrete block, or bricks, is the solution for you.